Our family recently entered the Brave New World as we welcomed a new guest into our home. After helping out a family member with a big favor, we were surprised to receive an Amazon Echo in return — a device that I might never have bought myself, but I certainly wasn’t going to turn down a free one! After convincing Funology Mom that it would be incredibly rude to return a gift, I ripped open the box like a kid on Christmas morning. The innocuous black cylinder sits on the shelf until you summon it from the dark depths of the netherworld by calling out it’s name, “Alexa!” A blue light pulsates around the rim, like a Cylon raider. It sits, awaiting your command. Oh, the possibilities! What should I do with all this power? The Echo is Amazon’s way of infiltrating every household in America and spying on our every move. While that may be true, it’s also a pretty nifty gadget! 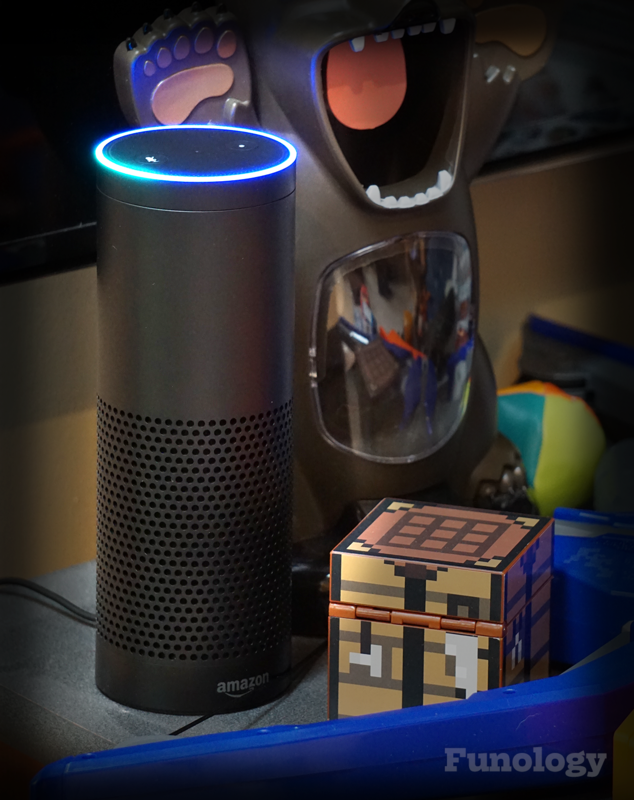 After a fairly simple set up process, the first thing I asked Alexa, the Echo’s female-voiced controller, was to play some music. She replied with some popular top 40 songs. The rest of the afternoon had me asking Alexa to play favorite songs, trying to stump her with some obscure ones, but she did an amazing job, except when I wanted to listen to brand new songs. If I had set up one of the music services like Spotify, I would have been able to listen to these songs, but the amount of available music with just Amazon Prime was pretty impressive. The kids have put the poor device through the wringer, trying to confuse it with silly questions, but she keeps up amazingly well. Besides the music, my favorite feature is the weather report, which is pulled from local sources and is more accurate than the old thermometer on the porch. The Echo doesn’t do anything that you can’t already do on your other devices, it just makes it so much easier, and voice control is awesome! This morning, the munchkins were a little sluggish while getting ready for school. “Alexa, play ‘Flight of the Valkyries,’ and turn up the volume.” That did the trick. After seeing the Echo in action, it’s obvious that this is a game changer that will become a part of our daily life. This is some serious George Jetson kind of technology, and now, I’m trying to calculate how many Echo Dots we need to sprinkle around the rest of the house. Oh, and I might need some of those smart lightbulbs, and maybe a smart garage door opener, and… uh oh. This post contains affiliate links, which means I may receive compensation if you make a purchase using any of the links in the article.